When a masked madman known as "The Fantom" threatens to launch global Armageddon, legendary adventurer Allan Quatermain commands a legion of superheroes, the like of which mankind has never seen. Now, despite fighting their own personal demons - and each other - they must join forces to save the world. $23.075 million on 3002 screens. 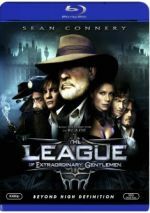 For a number of reasons, I rooted for 2003’s The League of Extraordinary Gentlemen to succeed. For one, I simply like this sort of action flick and always welcome more from the genre. In addition, I’d really enjoyed the prior comic book adaptation from director Stephen Norrington, 1998’s Blade. It offered a stylish and exciting take on the vampire mythos, and I hoped for something as compelling from LXG. Unfortunately, LXG fell well short of the levels achieved by Blade. Set it 1899, we learn of tensions between the biggest nations of Europe, and these increase when it appears that German troops raid the Bank of England. Soon thereafter, some British soldiers attack and destroy German zeppelins in a hangar, and the two countries approach the brink of war. The film then shifts to Africa, where Sanderson Reed (Tom Goodman-Hill), a representative of the British Empire, approaches legendary adventurer – and British expatriate – Allan Quatermain (Sean Connery) to help. Reed wants Quartermain to lead a team of heroes to avert the present threat. Allan reluctantly agrees after this mysterious foe attacks them, and he goes to England to meet ringleader “M” (Richard Roxburgh). There he hears about a villain called the Fantom who plans to sabotage a conference between England and Germany to set the world to war, where he’ll prosper from arms sales due to his advanced equipment. In quick succession, we get to know the various members of the League: Captain Nemo (Naseeruddin Shah), street criminal/Invisible Man Rodney Skinner (Tony Curran), vampire and scientist Mina Harker (Peta Wilson), and immortal Dorian Gray (Stuart Townsend). When the Fantom assaults them at Gray’s house, US Secret Service agent Tom Sawyer (Shane West) helps save their collective bacon, and he also becomes part of the team. The group quickly heads to Paris to recruit one more member: Dr. Jekyll/Mr. Hyde (Jason Flemyng). From there, they head toward Venice to stop the Phantom’s plans and also deal with the treachery of a turncoat member of the League. Many twists and turns pop up along the way. Too bad none of these help make LXG an intriguing story. In fact, the surprises just serve to highlight the tale’s flaws and make the movie seem too busy for its own good. Rather than focus on a coherent plot, it veers in many directions to try to fake out the viewer and make him think something significant will occur. It never quite does, so all the rattle and hum feels like little more than a lot of noise and little payoff. Probably the key example of the film’s flaws comes during the attack on Venice. With physical battles and a climactic chase sequence, this number should have played like gangbusters. Instead, it comes across like less than the sum of its parts, as none of the various elements manage to engage the viewer. The flick tosses a lot at us but doesn’t produce much stimulation. Part of the problem also comes from the movie’s editorial style. Norrington uses an awful lot of really quick cuts, apparently intended to convey a sense of urgency and speed. Unfortunately, these just make the action sequences seem disjointed and tough to follow. We see so much visual trickery that we never get a feeling of reality or impact. LXG takes a long time to get going, and some of that seems inevitable for a movie with so many different characters to introduce. That said, I don’t recall feeling quite so bored with the first X-Men flick, and it needed to bring in more personalities than seen here. The characters never enjoy much exposition, so we get a couple of banal and simplistic impressions of them and that’s about it. The film’s first act isn’t just character introduction, of course, as it also pursues the plot about the Fantom and his scheme. This doesn’t go particularly well either. The story seems convoluted and only becomes more confused as the movie progresses. LXG veers dangerously into Scooby-Doo territory at times and never presents a plot that seems intriguing or compelling. With the fate of the world at stake, you’d think that’d be easy to achieve, but LXG can’t do it. It also doesn’t help that most of the actors seem rather disinterested in their characters. Connery remains reasonably authoritative and distinctive, but even he can’t stand out among this bland crowd. Each actor sticks with one-dimensional attributes and never manages to bust out of that range. They’re flat characters who don’t attract much interest from us. Without a compelling story, charismatic and intriguing characters, or vivid action, it’s hard to find much to like about The League of Extraordinary Gentlemen. To be fair, the movie isn’t as big a bust as I might make it sound, but the level of disappointment it causes probably makes me bust on it to a higher degree. Given the material at hand and the talent involved, LXG could – and should – have been a visceral and fluid action flick, but instead, it just plods along and fails to go anywhere. The League of Extraordinary Gentlemen appears in an aspect ratio of approximately 2.35:1 on this Blu-ray Disc. An early Blu-ray, LXG didn’t look bad, but it seemed a bit spotty. Sharpness was adequate. The movie usually provided pretty good clarity, though it rarely seemed particularly sharp. This meant the movie came across as reasonably concise but not extremely detailed. I saw no instances of jagged edges or shimmering, but some light edge enhancement popped up at times. The image lacked any evidence of source flaws, but I got the feeling some digital noise reduction was used, as the film could show some of the mushiness that comes with that technique. LXG maintained a generally dark look, which meant we experienced few dynamic tones. The colors remained subdued but seemed acceptable; the general flatness that came with the transfer affected the tones. Blacks followed suit. Dark tones showed decent reproduction but could be inky, while shadows were a bit too dense. Like the colors and sharpness, the image’s vague sense of muddiness affected these scenes. Nothing here looked terrible, but the whole package remained average. On the other hand, the DTS-HD MA 5.1 soundtrack of The League of Extraordinary Gentlemen seemed very impressive. The soundfield contributed an extremely active affair that helped make the movie more engaging. The material came from all around the spectrum and seemed neatly and accurately distributed. Quieter scenes like those aboard the Nautilus demonstrated a smooth and believable sense of atmosphere, one in which elements like lapping waves popped up cleanly. The many louder segments really brought the track to life, though. From the opening images of the Phantom’s rumbling tank through all the fights, the capture of Mr. Hyde, and any of the many other lively sequences, LXG used all five channels in a vivid and involving manner. The components appeared in the right places and meshed together smoothly. This became a truly impressive soundfield. Audio quality kept pace with the soundscape. Dialogue seemed natural and distinctive, and I encountered no issues connected to intelligibility or edginess. However, the loudness of the other parts of the mix occasionally drowned out the speech to a minor degree. Music sounded firm and dynamic, with clean highs and tight lows. Unsurprisingly, the effects created the parts of the mix with the biggest impact. Those elements seemed crisp and concise, and they suffered from no signs of distortion or other problems. The film poured on the bass, and those bits seemed tight and powerful. LXG provided a simply outstanding soundtrack that worked very well from start to finish. How does the Blu-ray compare with the original DVD from 2003? Audio offered more range and power, while the visuals seemed more concise and clear. I might not have been impressed by the Blu-ray’s picture, but it still worked a bit better than the DVD. The Blu-ray mixes old and new extras, and we find two audio commentaries. The first comes from producers Don Murphy and Trevor Albert and actors Shane West, Jason Flemyng, and Tony Curran. The last two actors sit together, while the other three are solo for their comments, which are edited together into this coherent whole. The format works well and creates a nicely paced and entertaining commentary. We learn about a nice mix of elements, with an emphasis on locations and turning the Czech Republic into different places via effects, the adaptation of the graphic novel, and working on the characters. Curran and Flemyng amusingly take the piss out of the film with their funny anecdotes and impressions. They give us a glib piece that includes a lot of good material, especially in regard to their interactions with Sean Connery. Murphy proves almost irritable at times, at least when he addresses fan quibbles about liberties taken, so he almost gets nasty on occasion. Some moderate gaps pop up during the piece, but not too many empty spaces mar it. Overall, the commentary seems likable, informative, and engaging. For the second commentary, we hear from costume designer Jacqueline West, visual effects supervisor John E. Sullivan, make-up effects supervisor Steve Johnson, and miniatures creator Matthew Gratzner, all of whom sit separately for this track. Not surprisingly, the commentary mostly touches on technical issues. The various visual elements dominate, with notes on different forms of effects, the Hyde costume, and character outfits. West proves to be the most active and engaging participant. She really delves into the details of her wardrobe designs and choices and offers a slew of great details on the subject. The others also add nice remarks, but West stands out as the most useful of the bunch. Overall, the track seems compelling and expands our understanding of the various topics. New to the Blu-ray, a Trivia Track accompanies the film. This provides info about the production as well as aspects of the source material and story/characters. The notes pop up too infrequently to contribute much. Another Blu-ray exclusive, Shooting Gallery offers a game. This requires you to move a cursor around the TV screen and fire at characters. It’s awkward and wholly lacking in entertainment value – or purpose. An unusual index appears via Search Content. Instead of the usual chapter stops, this domain lists a slew of movie characters and topics and allows the viewer to find all of the times they appear in the film. I don’t know how useful this is, but it’s an interesting addition. 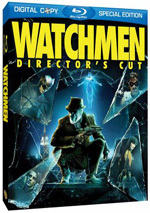 The Blu-ray also provides a collection of trailers. We locate ads for LXG as well as Transporter, Transporter 2, Planet of the Apes (2001), Phone Booth, Behind Enemy Lines, and Kiss of the Dragon. Like most early Fox Blu-rays, LXG drops features from the DVD. We lose deleted/extended scenes and a documentary. A fairly messy mish-mash of a superhero flick, The League of Extraordinary Gentlemen sits as one of 2003’s bigger disappointments. Director Stephen Norrington set the bar high with his prior flick, but LXG doesn’t remotely live up to the highs of Blade. The Blu-ray provides excellent audio along with mediocre picture and a few interesting supplements. LXG remains a let-down as a movie.